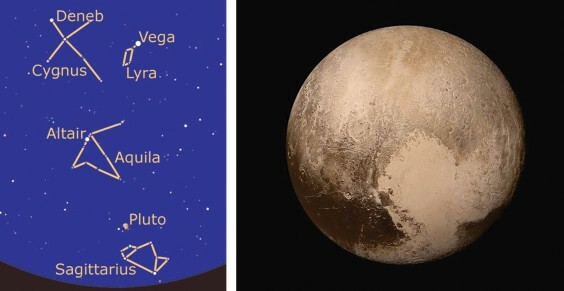 Pluto has been in the news recently and I thought it might be fun to have a roam around the sky and try to find it. Start by facing south and looking high overhead as soon as it is dark enough to see stars. Almost vertically above your head you should see a bright star sitting at the top of a cross of stars (if you haven’t fallen over backwards, that is). This is Deneb and the cross is, in fact, a swan called Cygnus. If the night is clear, you should be able to spot the Milky Way running down through it. To the right you can easily spot the brightest-looking star in the sky at the moment: Vega. It has a small parallelogram of stars hanging down beneath it forming the constellation of Lyra. Halfway down towards the horizon is a third bright star, Altair, forming a sort of isosceles triangle (whatever that is!) with Deneb and Vega. Altair sits in its own little triangle of stars which make up Aquila, the Eagle, but it’s not very distinct. Now, as well as making up the “Summer Triangle”, commonly used as a guide to other points of celestial interest, this trio of bright stars are interesting in their own right. Vega, as well as being famous in certain science-fiction stories, is one of the nearest stars in the night sky, at about 25 light years. That is to say that the light from it has taken 25 years to reach your eye (slightly longer to reach mine because it’s nearer the ground). It is about twice as massive as our Sun and is hotter, making it bluish in colour. This means that it is younger but won’t last as long – but, just like our Sun, it has been found to have an Asteroid Belt. Two of them in fact; an inner warm one and an outer cold one. This means it is likely to have planets and may even have a solar system similar to our own. Those science-fiction writers may have been closer to the truth than we realised. The lowest star in our triangle, Altair, is even closer at about 17 light years. It, too, is nearly twice the size of our Sun and a lot younger. It is surrounded by a cloud of dust so may have planets but, being so young, it is unlikely that intelligent life has had time to form, unlike here on Earth(?). Altair has been found to be rotating once every ten hours which probably makes it bulge out around the middle into an ellipsoid shape (and it might make it a bit dizzy too). t around 1,500 light years away, it must be very bright indeed and is possibly the brightest star in our galaxy. It must be very large too, so could end in a Supernova sometime soon. Now, following a line down from Deneb, through Altair to the horizon, you may be able to make out the “teapot” shape of Sagittarius. This is very tricky because it tends to be lost in the glow from Redditch. If you can find it, Pluto is sitting above the handle. If you screw your eyes up really tight while looking in this direction . . . you still won’t see it. It is too small and too far away – BUT you have got to know your way round a bit of our night sky while finding its location. Anyway, the New Horizons spacecraft has been there and sent back some wonderful holiday snaps. Next month, I’ll try and find something else you can’t see! Pluto image courtesy of NASA.